I've been following James Dashner for awhile now, ever since I received an advanced reader copy of the first book in his The 13th Reality series The Journal of Curious Letters. I enjoyed it enough that I tracked down his earlier series, The Jimmy Fincher Saga. There were some definite improvements in his writing from Jimmy Fincher to The 13th Reality, but you could see the potential in each series that there was something more in James that was wanting to get out, something bigger. And I think that The Maze Runner is that something. From personal request of the author from his blog, I'm going to leave this review as spoiler free as possible, which of course means that I'm not going to be able to say much at all. The story opens with Thomas finding himself in a metal box that seems to be moving, with no memories of his life, his family, even of who he is. He knows his name is Thomas, and beyond that, he remembers very little of his life before waking up in the box. The box deposits him into the Glade, where he is met by a large group of boys who also have no memory prior to waking in the box, just like Thomas. He soon learns the ropes of living in the Glade, where the boys each have assigned jobs such as gardening or tending to the livestock, but the one job that he is most interested in is being a Runner. 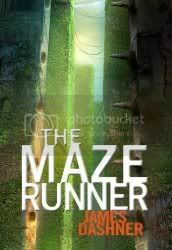 The Runners have probably the most important job in the Glade; they enter the huge Maze that surrounds the Glade, trying to find a way out, because as far as anyone can tell, there is no escape through the Maze. I think that's enough of a teaser with no major spoilers revealed. I know it's not much, but I can say that the book is fast-paced and doesn't quite let up through the whole story, and I never wanted to put the book down once I picked it up. There are some twists in the story, and while I had figured out part of the plot, I still wasn't sure how the entire story would play out or exactly what would be the answer to the question posed in the one plot point. Dashner does a great job of making the feelings of the boys tangible; you really get a sense of their desperation through the story, equally mingled with the continual hope that there will be a solution discovered to the Maze. The Maze Runner, like most books in this trend, is the first part in a series, but don't let that detract you from picking it up now. The first book that comes to mind as a comparison is Suzanne Collins' The Hunger Games, and if you are a fan of that book, I don't think you'll be disappointed in The Maze Runner. I've enjoyed watching James grow as a writer over these few short years, and I'm anxious to see where he will be taking us next, because if The Maze Runner is any indication, I'm sure there are some really fantastic ideas floating around in his head, just waiting to be put on paper. I didn't find "The Maze Runner" to be quite as stand-alone as "The Hunger Games," but that is partly because I just wanted to know more about the world that let The Glade come into being, which we only got a small peek at. I was so-so about this one, but the ending got me VERY excited about the next book. I can see where you're coming from with that, and I'm hoping that we'll get more info on the outside world as a whole in the next book. The way the ending did (or didn't) happen really left me wanting more too! So, the more I think about your comment, Jen, the more I think that's part of the draw of the story for me; that we are just as much in the dark as the kids are through the entire thing. We, as the reader, are not given privilege to any more information than the participants of the story, so everything that happens to them is just as much a surprise to us as it is to them. I know what you mean. Part of me always wants to wait until all the books are published, because then I don't have to wait, but then the other part of me wants to read these RIGHT NOW! Of, course, then I CAN'T WAIT FOR THE NEXT ONE!